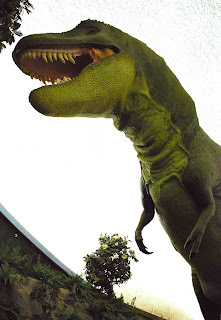 of the visitor's center in "Jurassic Park", the movie. 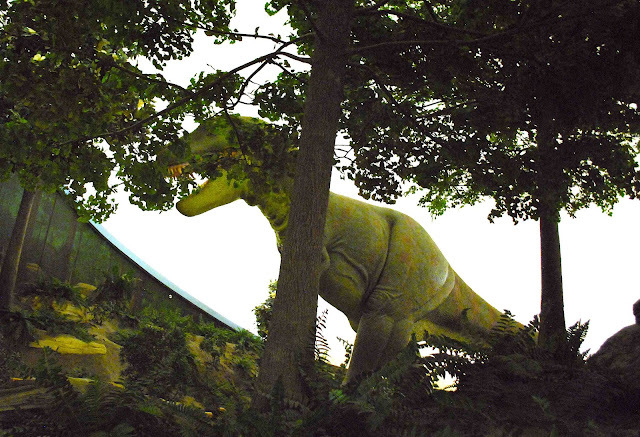 A Tyrannosaurid (T-Rex) viewed through the trees on the 2nd floor of the museum. The museum has 3,750,000 specimens of fossils*, mostly from the Cretaceous Period. 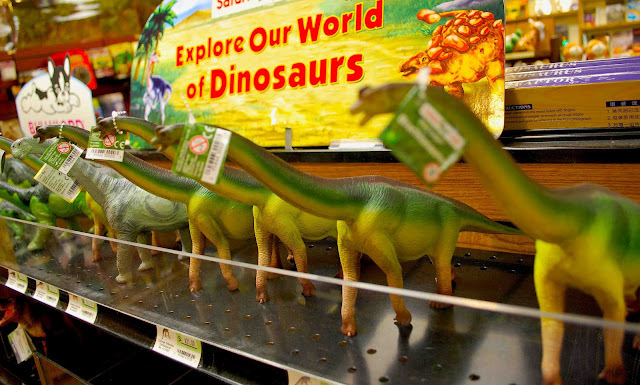 It may be the REAL "Jurassic Park"
Winged reptiles, called pterosaurs, ruled the skies over the warm sea that covered Kansas during the Cretaceous Period. 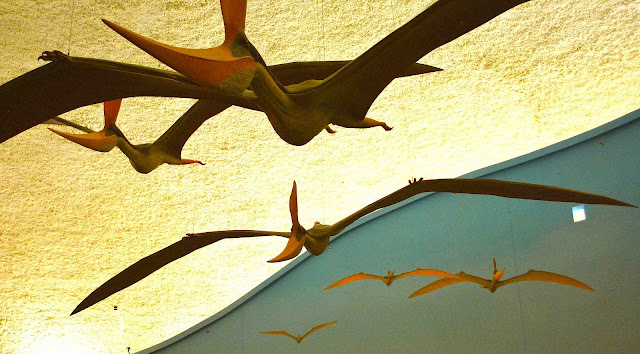 Pterosaurs nested along the shore, but flew far out to sea in search of fish, their main food supply. 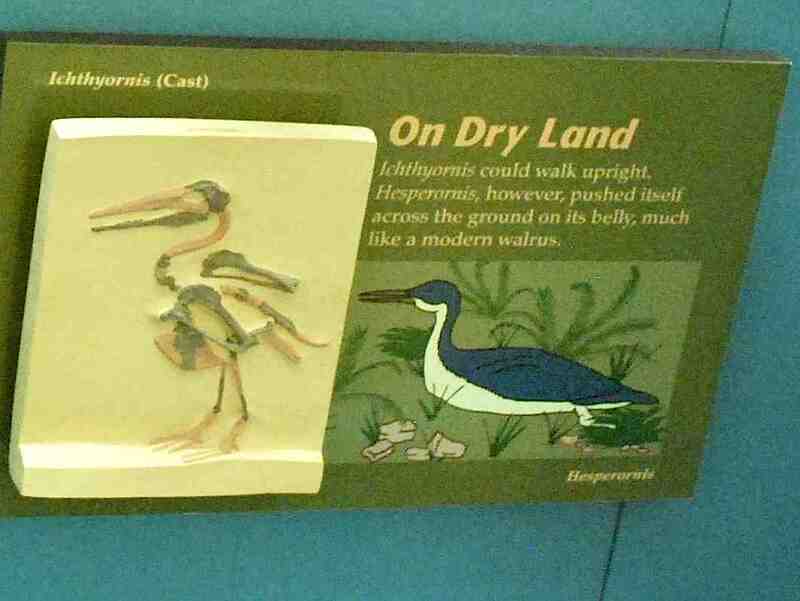 Male Pteranodon sternbergi (above) were toothless flying reptiles with 23 foot wingspans, females had 13 foot wingspans. Driving east/west through Kansas on I-70 is a long and time consuming task. 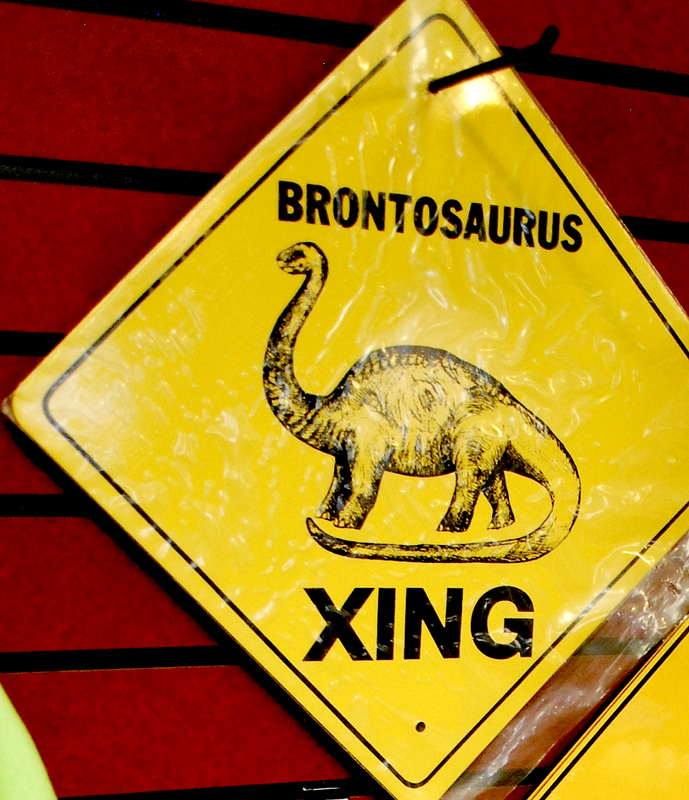 Kansas citizens have been smart enough to put respites along the way to give relief to the blurry-eyed drivers and usually to attract some of their money. 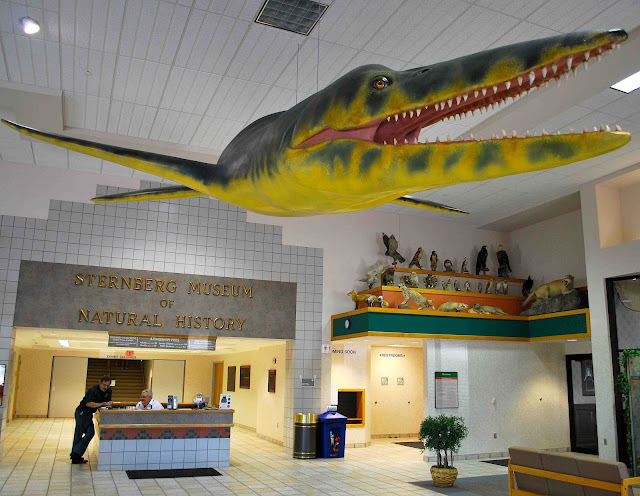 The Sternberg Museum of Natural History is not a tourist trap, but a functioning museum and a formal part of the Fort Hays State University campus. 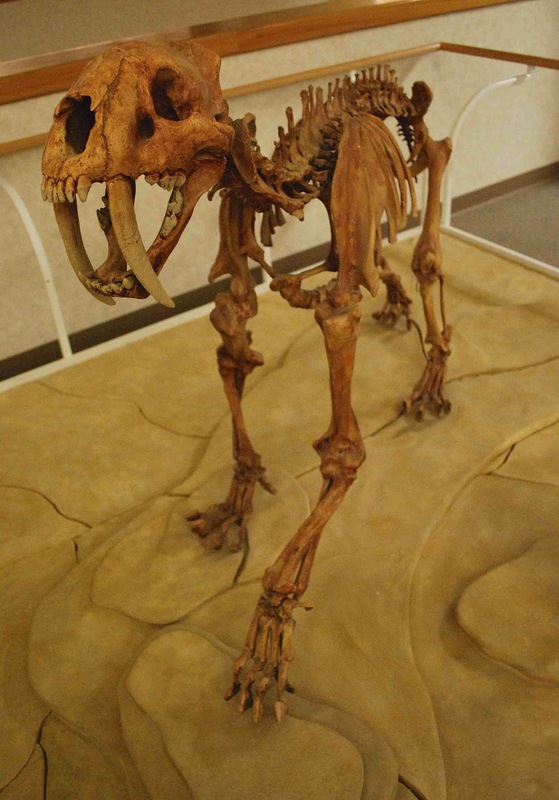 The permanent exhibits on the main floor of the museum include fossils collected from prehistoric seabeds in Kansas, Colorado, Wyoming and Canada. There are also mineral exhibits and videos explaining the history of the museum and story of the museum's founder and his most famous fossil a "Fish within a Fish." 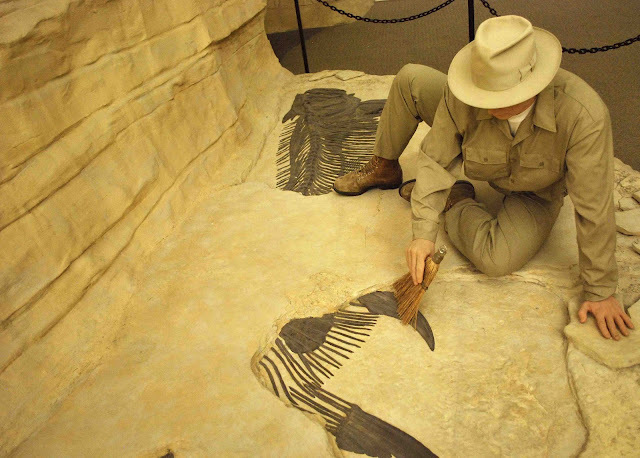 George Fryer Sternberg (1883–1969) was a paleontologist best known for his digs and fossil collecting in the cretaceous sea beds of North America's western plains. 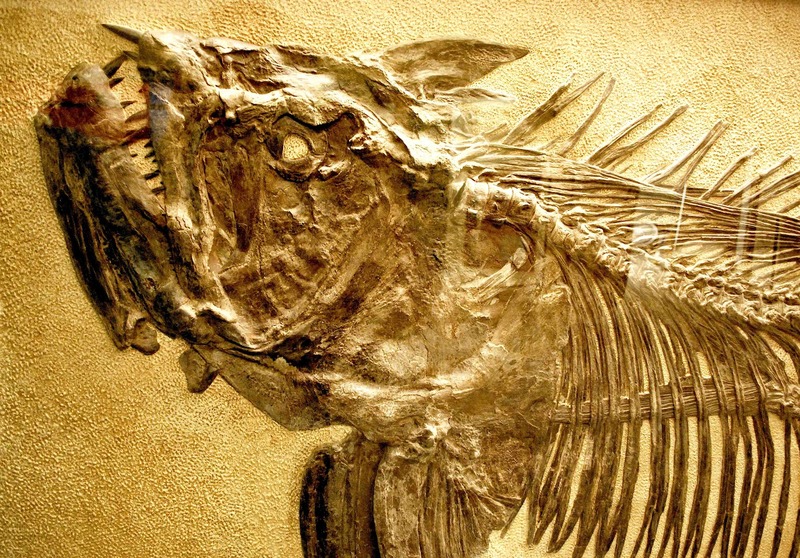 fossil finds—the now famous "Fish-within-a-Fish." 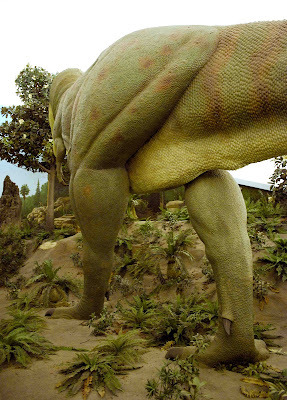 In 1952, Sternberg discovered this 14-foot Xiphactinus (Zie-FACT-i-nus) with its final meal, a 6-foot Gillicus, preserved within its ribcage. Above is a photo of the actual specimen. 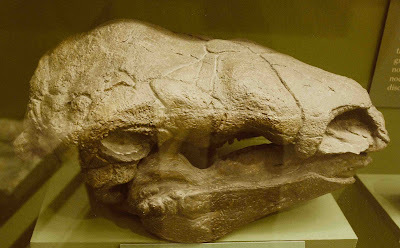 Head detail of the actual Xiphactinus. It will take an hour or more to see the exhibitions if you study the displays. If only slightly interested, you can run through the small museum and do the gift shop in about 30 minutes, using it as a good and different type of break from driving. 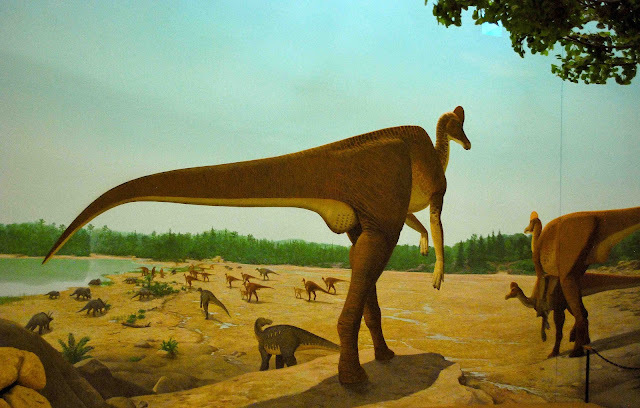 This Deinonychus lived along the sea shore. 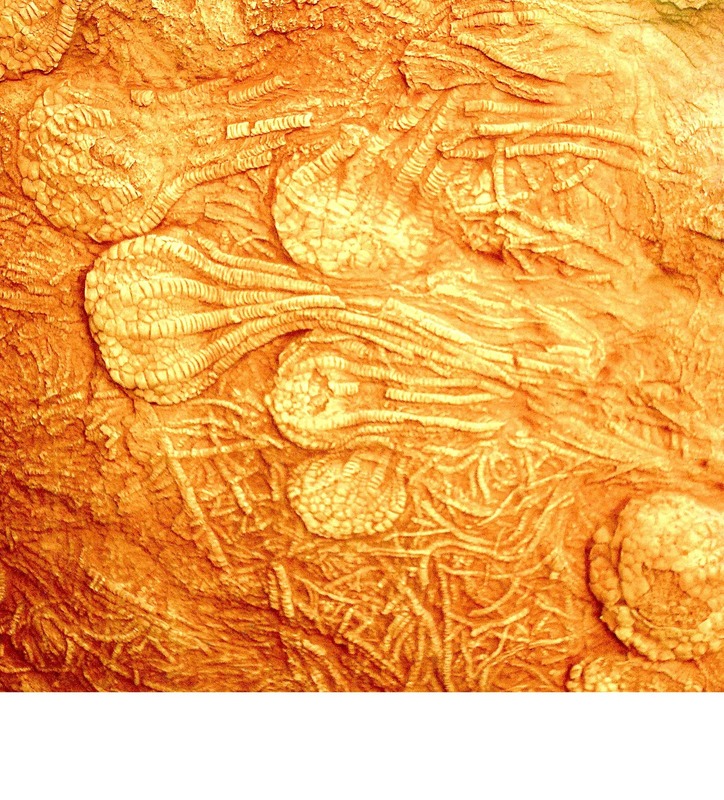 Fossils are mostly found in rock which was once the muddy sea floor. For land creatures to fossilize they had to be washed out to sea or stuck in quick sand, or some other boggy sediment, in order to be preserved within Cretaceous rocks. Thus the land animals are much more rare than ocean life. 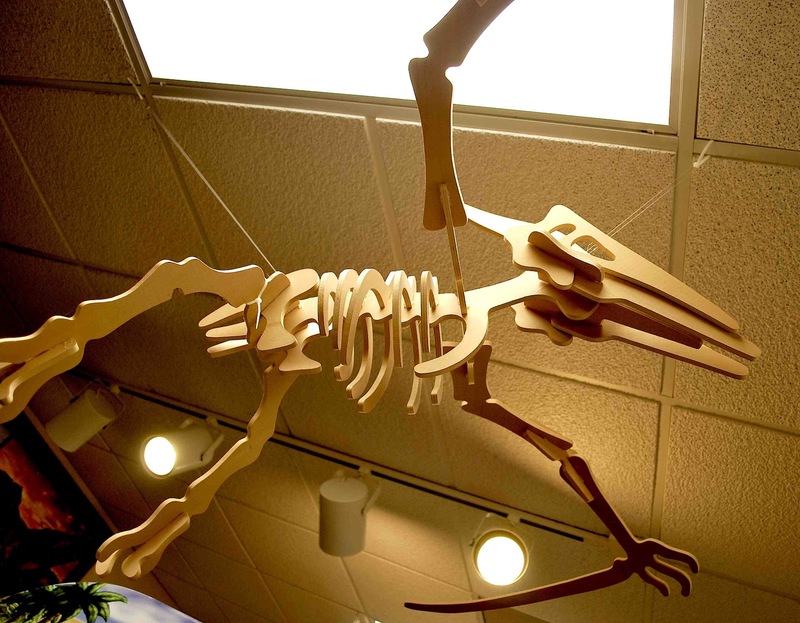 Pterosaurs: Pteranodon sternbergi (skull shown lower left) was a toothless flying reptile, with a huge wingspan. 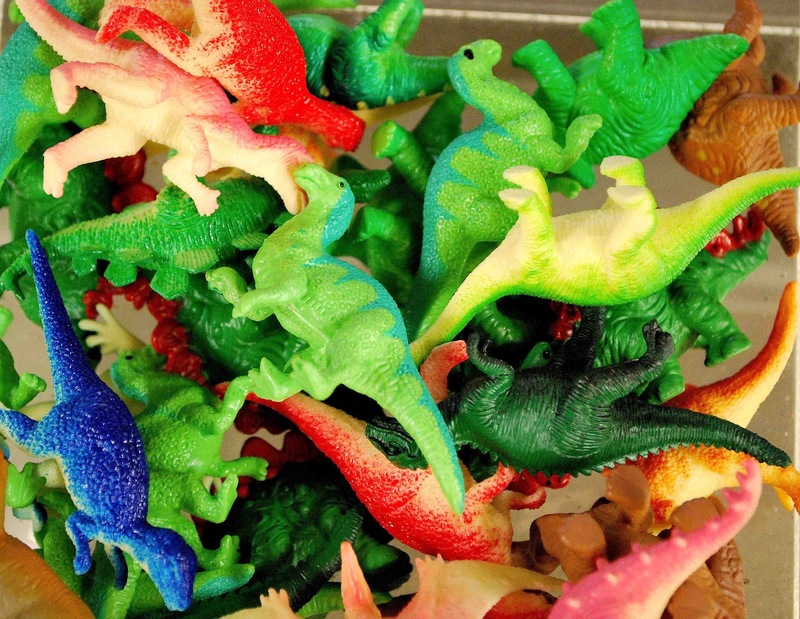 Winged reptiles and toothed birds nested on land but hunted at sea. 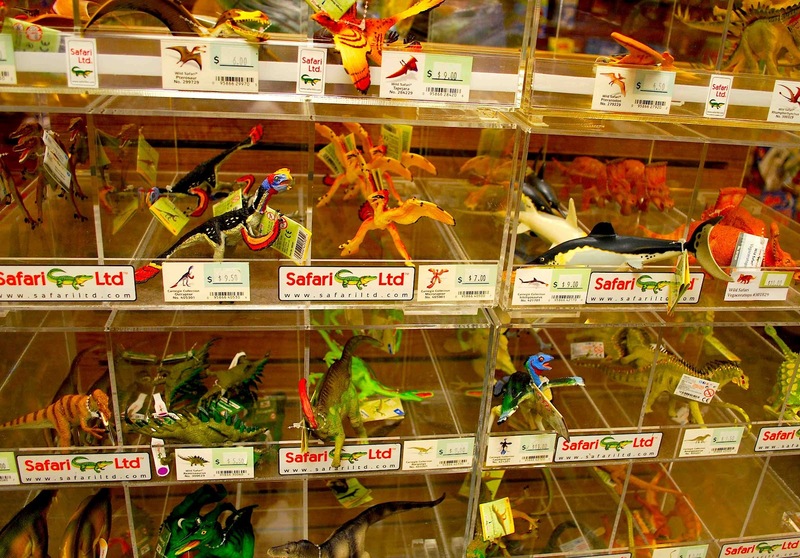 From high in the late Cretaceous skies, they had an excellent view of the fish they preyed upon. The Hesperonrnis, toothed bird, was unable to fly and had thick & heavy bones. Hesperornis had strong leg muscles and lobed feet to push the diving bird through the water and the stunted wings were useless for flight. 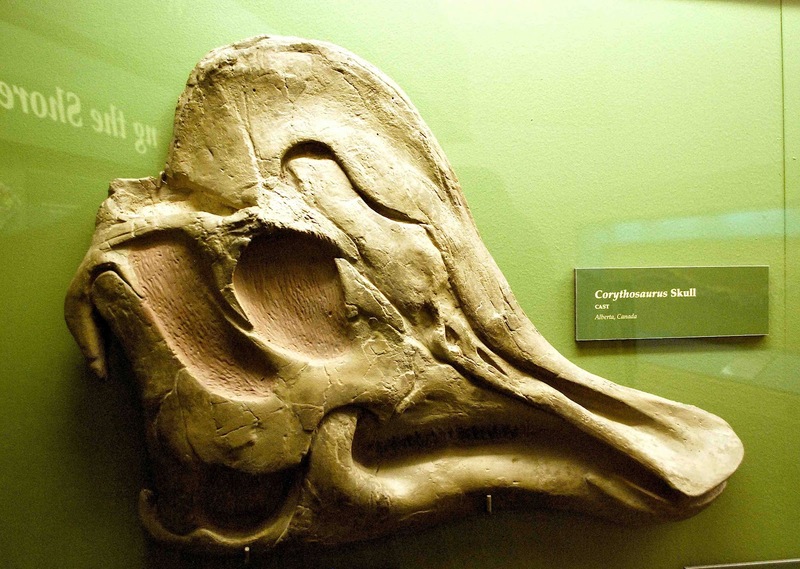 On land the Hesperornis would push itself across the ground on its belly, much like a modern walrus. 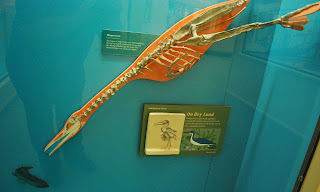 Ichthyornis bone cast & Hesperornis illustration. This Dolichorhynchops was a short-necked plesiosaur. It was 10 feet long with a streamlined body that used it's flippers to propell itself through the water. It's ability to move with quick and agile turns plus it's razor-like teeth gave it the title of "tiger of the sea." 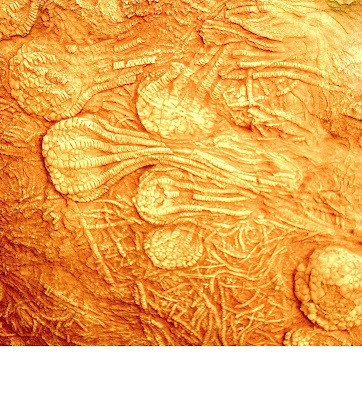 Interesting examples of fossilized dinosaur skin. Skull of a duck-billed "Dinosaur Corythosaurus"
Various facial horns and neck frills characterize the ceratops. Appearing late in the Cretaceous Period, horned dinosaurs quickly evolved into many different species. They walked on all fours and traveled in large grazing herds throughout western North America. In the museum a ramp leads up to the top floor where you pass through life sized displays recreating the ancient seas, from 70 million years ago when the fossilized bones you have been viewing, were living and swimming. The walkway leads up to displays of land and air animals which would have been found near the beaches. The animals are recreated life-sized and the T-Rex has an animatronic feature. 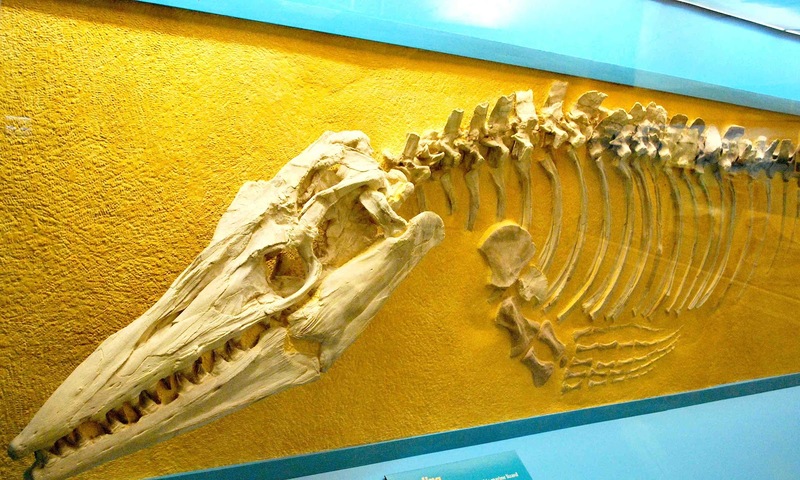 The robust, cone-shaped teeth on this marine lizard Tylosaurus give clues to the kinds of animals it ate. 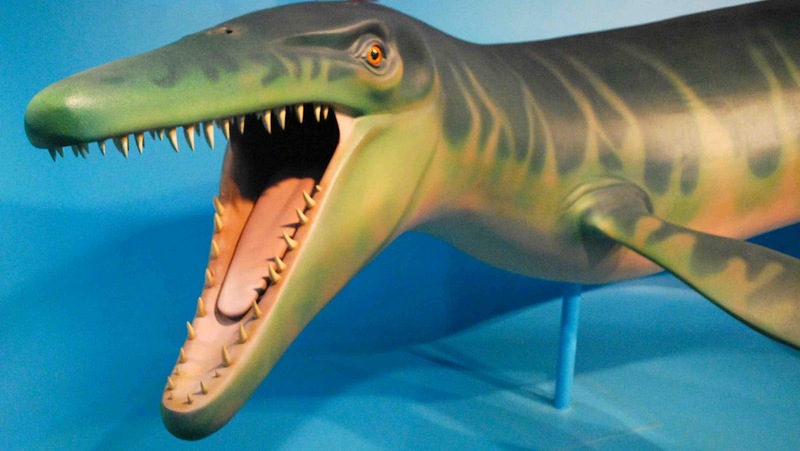 These teeth worked best for holding fleshy animals like sharks or smaller mosasaurs, but life was precarious for even the most savage predators, as they were also prey for larger sea creatures in the ongoing battle for supremacy of the sea. 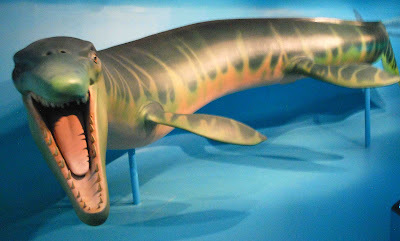 A model of the marine lizard "Tylosaurus." 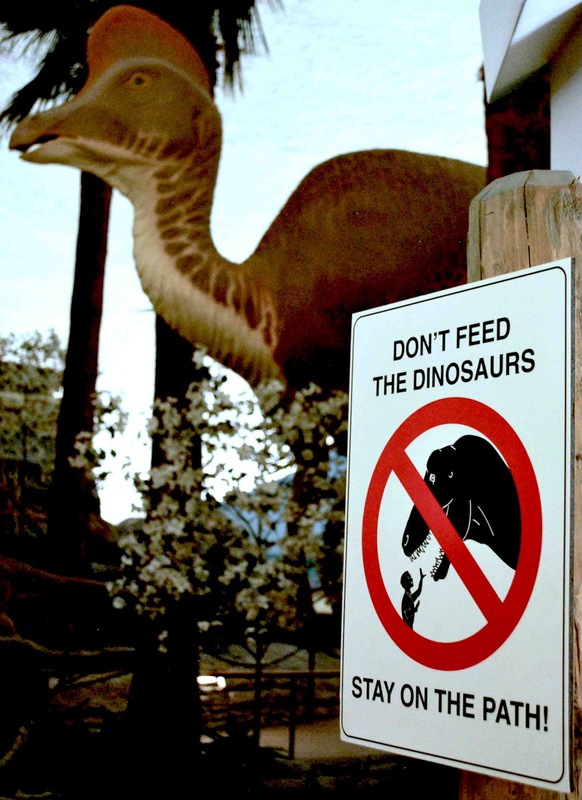 Three groups of meat eaters hunted during the Late Cretaceous Period. 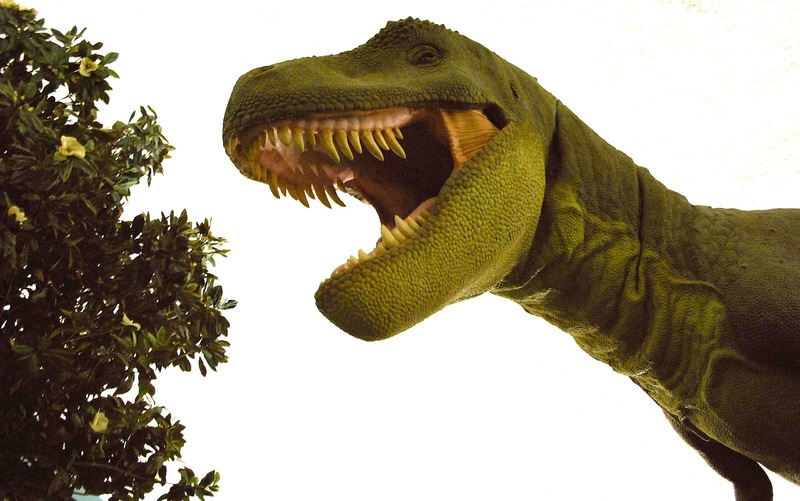 These included the large tyrannosaurids like Tyrannosaurus Rex, Albertausaurus, Daspletosaurus and the smaller dromaeosaurids like Deinonychus. 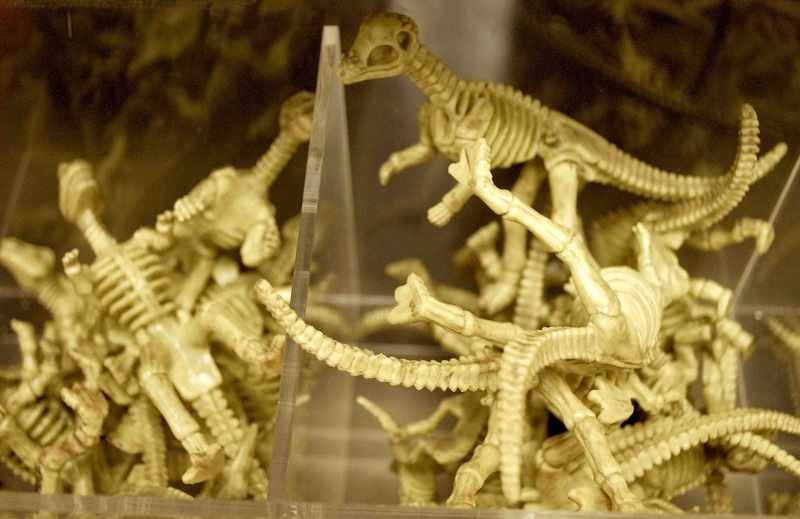 A third group, the toothless ornithomimids like Chirostenotes, may have been omnivores, feeding on eggs, small animals, carrion (dead animals), and plants. 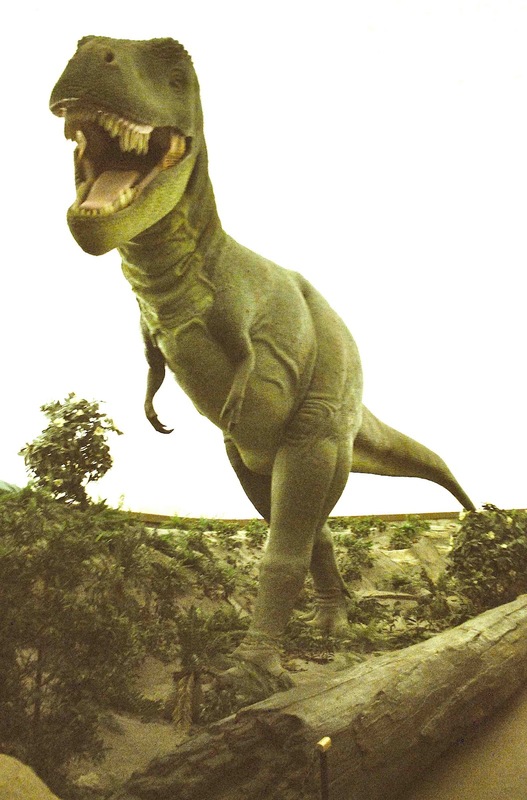 Tyrannosaurus Rex was one of the largest land carnivores of all time; the largest complete specimen, "Sue" (FMNH PR2081) was displayed in the Sternberg Museum for a period of time, she measured 12.3 metres (40 ft) long. 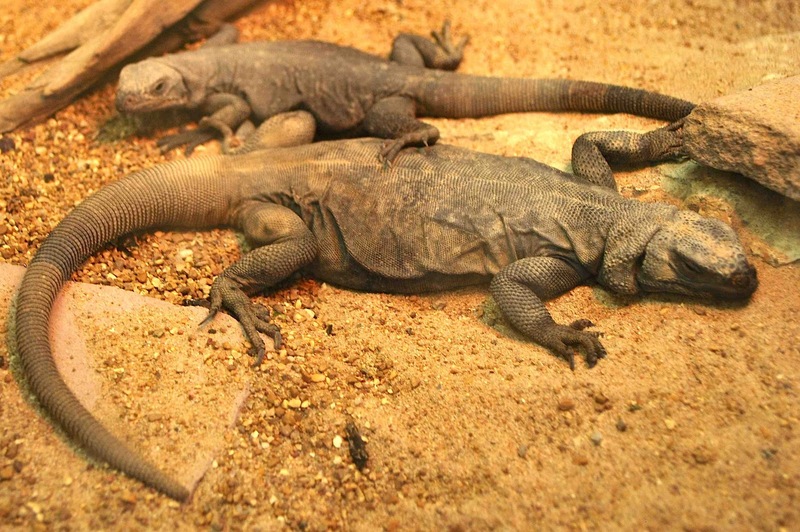 There are a half dozen displays of today's living reptiles (turtles-snakes-lizards) on the second floor of the museum, plus many stuffed birds and a few living amphibians in the lobby. An angry rattler, ready to strike and shaking it's rattles. 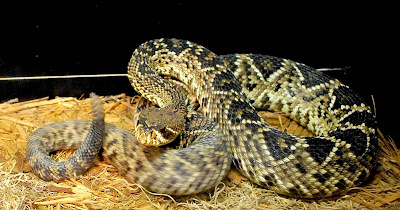 Same snake a moment later, coiled and defensive. The curators at the Sternberg Museum have created a one-of-a-kind exhibit that takes an in-depth look at rattlesnakes, with over 40 species of rattlers still alive on the planet today, including the 22 species found in the United States. 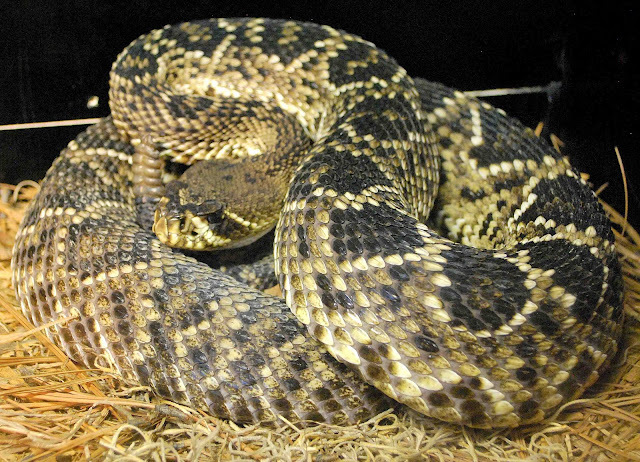 This exhibit centers on 19 LIVE rattlesnakes, ranging from the gigantic Eastern Diamondback, to the extremely toxic Tiger Rattlesnake. 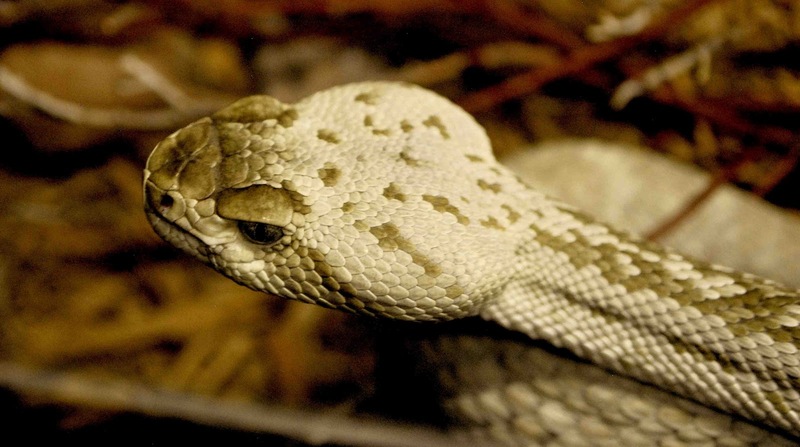 The exhibition graphically shows the habitats and makes notes of the unique behaviors of each species. The individual snakes in the display are regularly changed out, and the exhibition shows the many variations rattlesnakes have in coloration and scale patterns. 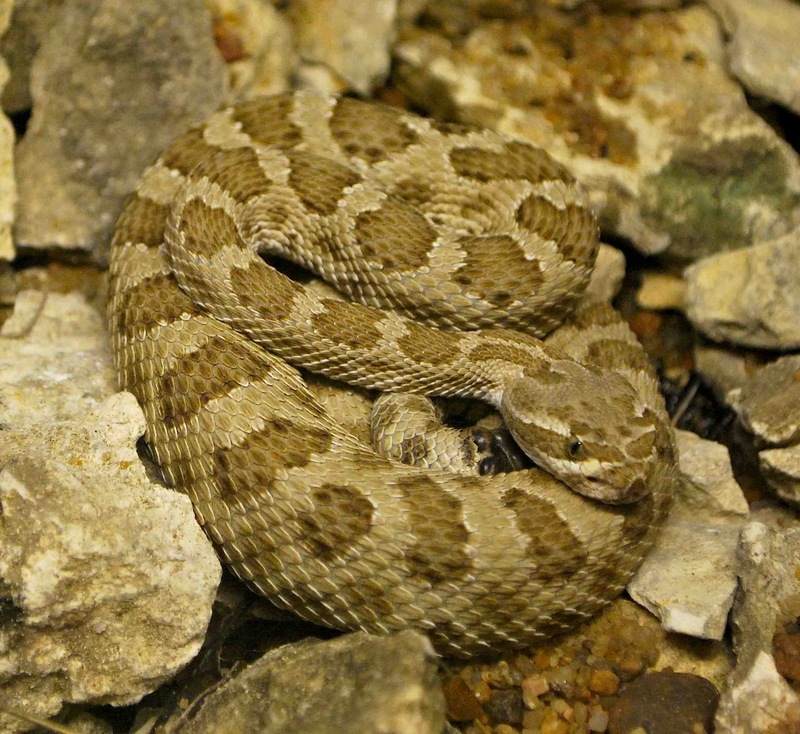 This particular snake is well camouflaged in the rocks. The Sternberg Museum also has a large gift shop and book store. 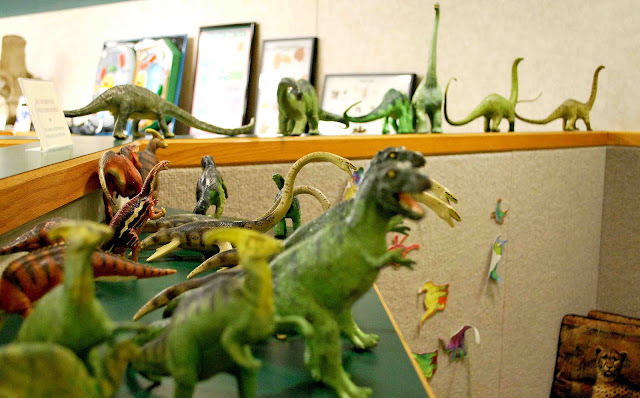 On the first Friday of every month youngsters are invited for a "Night at the Museum!" From 7 – 11 pm exploring the exhibitions, live animal displays, fossils and hands-on time with a special fossil-dig sand pile, and the bones and toys in the discovery room. Every month the activities change. Mix all ingredients together in a quart jar and refrigerate. Allowed to combine for at least 24 hours. ITALIAN SALAD: Dress your favorite dinner salad with oil & vinegar, salt & pepper, then spoon a healthy portion of Olive Salad on top = a N.O. Italian salad! 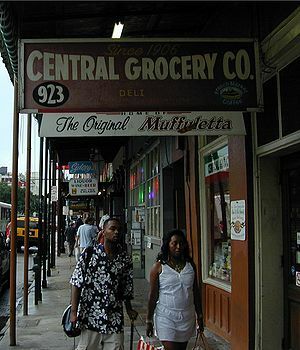 Central Grocery Co. in the French Quarter is famous as the home of the New Orleans Muffuletta Sandwich invented by Salvatore Lupo, to feed the Sicilian truck farmers who sold their produce at the Farmer's Market on Decatur Street in the French Quarter. Split horizontally a loaf of 10" Focaccia bread or any crusty topped loaf, roll or bun and brush the inside with olive oil. In New Orleans special Muffuletta loafs are baked and sold. Layer slices of Baked Ham, Provolone cheese, Italian Salami, Swiss cheese, Pepperoni or other Italian deli meats or cheeses, then spread a generous amount of Olive Salad on top. The sandwich can be put under the broiler to soften the cheese or it can be eaten cold, usually cut into halves or quarters before serving. The proprietors of Central Grocery in New Orleans pronounce Muffuletta: "moo-foo-LET-ta, alternate pronunciations are "muff-a-LET-ta" and "muff-foo-LOT-ta". 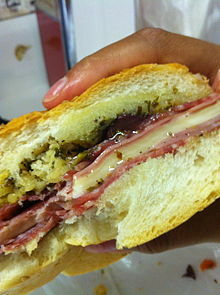 The Muffuletta was only locally known in New Orleans until the late 1960s. Now, it has international fame. New Orlean's Central Grocery sells not only the sandwiches as take-out or eat-in, but also the ingredients of the muffuletta—including olive salad by the jar—for people who want to make their sandwich at home. "Olive Salad" is also produced for restaurants and retail sale by commercial vendors, including: Boscoli Family; Rouses; Dorignacs; Franks; Roland Imported Foods (www.rolandfood.com) and Aunt Sally's. ARTSnFOOD, is an online publication dedicated to "The Pursuit of Happiness, the Arts and Food." ™ All rights reserved. Concept, Original Art, Text & Photographs are © Copyright 2012 Jack A. Atkinson under all International intellectual property and copyright laws. All gallery, museum, fair, auction or festival photographs were taken with permission. Images © individual artists, fabricators, respective owners or assignees. The animal at the very top is actually Brachauchenius, which is a short necked (Pliosaurid) plesiosaur; Tylosaurus is a mosasaur. Dear Anonymous, anonymous feedback is not accepted.